Early Sunday morning, I stumbled sleepily off the plane in Boston not knowing where I’d go next. Thankfully, I found a last-minute couch with a gal named Mónica, who looked very close to the airport on Google maps. Slow and sweating, I shuffled with my two heavy backpacks to her house in East Boston. Mónica welcomed this exhausted couchsurfer with a wide, infectious smile. We went straight to Harvard Square’s Oktoberfest, where I wandered around the grand old buildings of Harvard University and joined the massive street party. Several cordoned-off blocks were lined with jam-packed beer gardens and kiosks of mouthwatering foods from around the world. Les Muses Tanguent, an all-female Parisian marching band at HONK Festival + Oktoberfest. Strangely, the streets were also filled with brass marching bands. Sprawling troupes of mostly aging white people in outrageous costumes belted out big band renditions of jazz hits, rock oldies and Nirvana. They generated spontaneous dancing crowds reveling in the chaos. This was part of HONK Festival, combined for one day only with Oktoberfest! I learned this from an all-girls’ band from Paris, France uniformed in zebra and leopard print (smoking profusely, with a large contingent on the French horn). I enjoyed a local brew with a wonderful couchsurfer named Aden, who also took me to the Museum of Fine Arts for their free admission day. I wandered a section of the Freedom Trail that glorifyingly presents key sites where the American Revolution began. Being a history geek, it was actually pretty cool to see all the grandiose buildings with delicate stonework and the cobblestone streets. It just happened to be Columbus Day (a.k.a. colonial genocide day), so there were extra tour guide performers clad in period attire walking around pretending it was 1775. 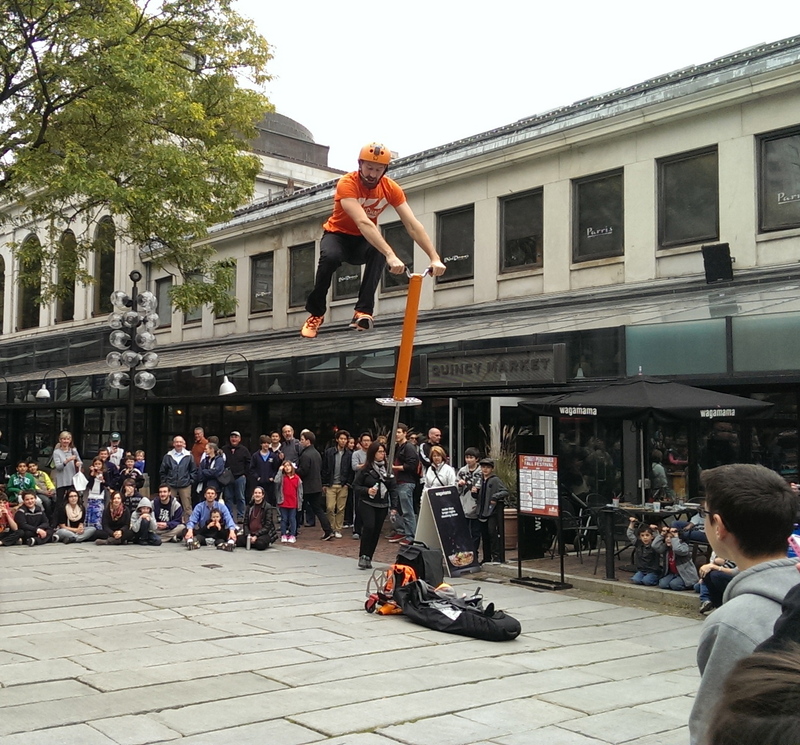 Having reached my intake limit of Indigenous history-erasing US patriotism for the day, I checked out a street performer festival at Quincy Market and the historic Faneuil Hall. There, I watched a guy do a front flip over the backs of a line of eight terrified bystanders. I think I landed in Boston on the best two days humanly possible! Spending time at Mónica’s was a highlight. Her home and her whole philosophy is about community – even though she just moved into her place, it was filled with couchsurfers, AirBnB-ers, and co-workers painting whimsical pictures and eating Mónica’s mouthwatering meals. She’s about to launch a new café in East Boston – a worker-owned co-operative – with a friend she met through Couchsurfing. La Sanghita Café is based on the principles of food as medicine and empowerment through community and education. It aims to make nutritious meals available to low-income residents of the neighbourhood. I was so inspired by what they’re co-creating – and the fact that it was Canadian Thanksgiving – that I roasted a pumpkin and made small-batch pumpkin pudding with silken tofu, yogurt, maple syrup, and cardamom. It was a big hit! 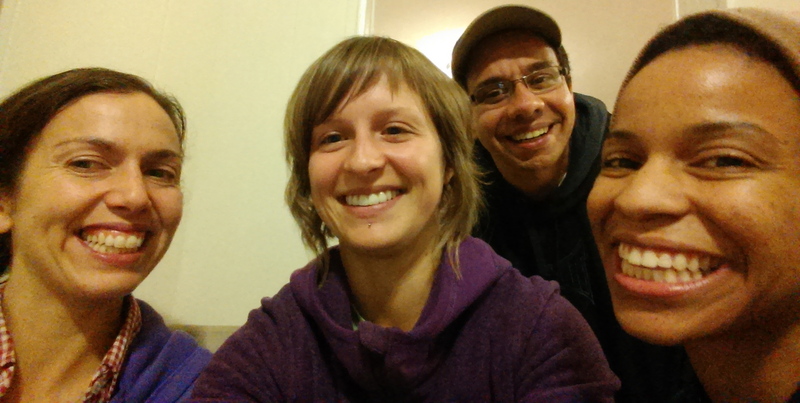 Mónica, me, Haroldo from Brazil, and Adryn, couchsurfer-turned-business partner. I picked up my next rental, a rusty 1998 Plymouth Breeze, and headed for Plymouth, New Hampshire. On the outskirts of Boston, I had to stop at Walden Pond where transcendentalist and philosopher Henry David Thoreau famously built his cabin on the land of Ralph Waldo Emerson. His two years there is recorded in Walden, first published in 1854. It’s considered one of the founding pieces of literature sparking the American conservation movement. His memoir reflects on the virtue of living simply in nature, practicing self-reliance, and spiritual self-discovery. It was truly a serene scene, with golden fall hues dotting the woods. Swimmers basked on tiny strips of beach in the remarkably warm mid-October sun. I sat and reflected awhile. My new couchsurf friend Aram was a student of a Thoreau scholar, and he had carefully explained to me some essential ideas in Walden, urging me to visit the pond. I’d encountered bits and pieces of Thoreau as an Environmental Studies student. A while back, I had downloaded an audiobook of Walden without necessarily thinking I’d get around to listening to it. Now, it was clearly time. So I hopped in the car, hit play, and began my New England road trip. I went to the woods because I wished to live deliberately, to front only the essential facts of life. The Pemigewasset River beside Plymouth’s main street. Plymouth State University knows how to enjoy the fall colours. I did honestly feel like I was driving back in time. Tiny Plymouth, with its Victorian houses and pillared colonial style brick buildings, looked like it had barely changed in two hundred years. I headed straight to the EcoHouse, which greets town visitors at the roundabout on the historic main street. It’s an old clapboard house that has undergone an eco-efficiency makeover and now acts as a hub for Plymouth State University’s sustainability initiatives. Green-minded students reside at this “living laboratory” which features a solar hot water system, permaculture gardens, and a toolshed built completely with local wood and recycled materials. Next, I visited the beautiful homestead of permaculture teacher Steve Whitman. His home has been refinished with natural clay paints, upcycled and local building materials, and solar hot water. Outside, his “bioshelter” is like a glorified greenhouse, with hopvines curling upward enveloping the south-facing structure. It’s designed to regulate its own temperature: the sun warms water, which heats the ground underneath its raised beds. These rows of baby greens will feed Steve’s family all winter. He’s also experimenting with rice in colourful terraced paddies. Steve’s property shows how permaculture design can make a space as aesthetically pleasing as it is functional. Steve waxed poetic about the many uses of the black locust trees onsite. The tree improves soil by fixing nitrogen, accumulating nutrients, controlling erosion, and reestablishing degraded landscapes. It provides edible flowers for humans and nectar for honeybees. It’s a source of high quality hardwood timber that is very quick-growing and resistant to rot and water. The wood burns very hot and slow, making it excellent firewood. It’s pretty much a superstar! Too bad the tree is considered an invasive pest in this region. Rather than labelling plants as being “bad,” why not cooperate with those that grow well in your climate and utilize what they have to offer? This moralizing perspective has grown out of a historical tendency in the conservation movement to uphold a myth of nature as pristine wilderness in need of preservation, rather than a dynamic system in flux. I wonder what Thoreau would think if he knew what kinds of thought and policy his book would lay the foundations for. Steve’s house on the right, with the glassed-in bioshelter on the left. When I recounted my day over red wine by the woodstove, my lovely couchsurf host Kate – who grew up in the area – insisted that I visit D Acres Permaculture Farm. Kate’s home was full of housemates and couchsurfers and one of them, Mike, tagged along. The farm’s been in the family for a few generations, and is now being managed by a fellow named Josh. Josh greeted us with an invitation to help him load his truck with buckets of gravel. Pretty soon we were unloading the buckets at his destination down the road and receiving our next invitation to help him haul sand. Bracing ourselves on the back of the pickup, we got a “driving tour” of the farm. We wound our way through several huge sloped fields with terraced fruit and nut orchards, greenhouses, annual beds and grain crops. Pigs were being utilized to clear new sections of land. They rooted around devouring the existing vegetation, leaving the soil manured and broken up, ready for planting. To our mild chagrin, we proceeded to spend the next hour hauling 5 gallon pails of sand from a pit in the woods. Water squished around in my tiny Toms slippers as they disappeared under the thick carpet of leaves. The one day I didn’t think to wear my leather boots. My arms and shoulders would ache for days. On the bright side, we had lots of time to ask Josh about the farm and his perspective on bringing permaculture into higher education. Though many school groups visit D Acres, there was a distinct air of skepticism in Josh’s voice about institutionalizing permaculture in these formal academic spaces, predicated as they are on bureaucracy, authoritative structures, and profit making. Josh in front of one of the many treehouses at D Acres. I sympathize with the many permies who’ve decided that working with universities is not a good use of their time. What’s the point of reinforcing the very institutions that are part of the problem? Is it worth it – for permaculturalists, for students, for schools – to engage at this glacial pace of change, when we’re in the midst of a planetary emergency? That question is at the core of my research. As we munched on juicy orchard pears, I questioned Josh about the ownership and governance of D Acres. I have a particular interest in how intentional communities function at the human and social organizational level. Planting fruit trees and designing landscapes is relatively easy – it’s the human element that always gets in the way of cooperative working and living, it seems. They say that 9 out of 10 intentional communities fail. Josh explained some of the broader challenges, a common story. A huge responsibility largely falls on the one or two people who actually invested in the land, while a revolving door of newbies leave after a season or a few years. This reinforces the main steward’s role in carrying through the knowledge and memory of the land. This can leave the founder without a clear exit strategy and result in little room for others to take ownership of their work. “Founders’ syndrome” plagues many organizations and communities. Mike in the kitchen garden.